Likes: Super cheap, easy to use, lasts!! 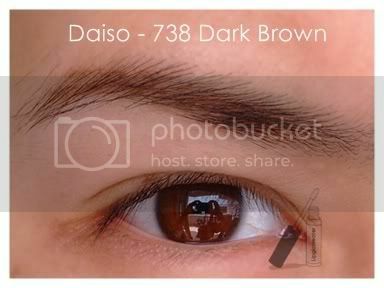 There are four colors available - Dark Brown, Brown, Black and Grey. I bought the Dark Brown and Brown ones. Dark Brown is a dark chocolate brown, and Brown is a medium gold brown. 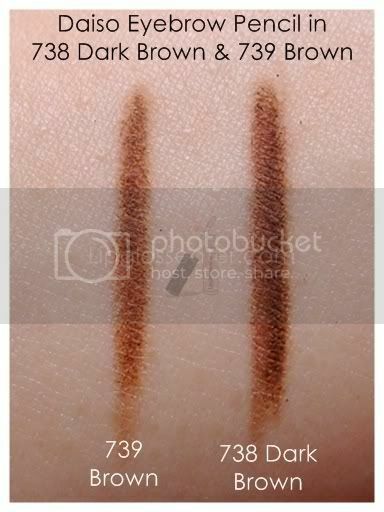 These two are quite pigmented - one swipe is all it takes for the color to show, but the intensity is definitely buildable. I'm using the Dark Brown one in my FOTD here. 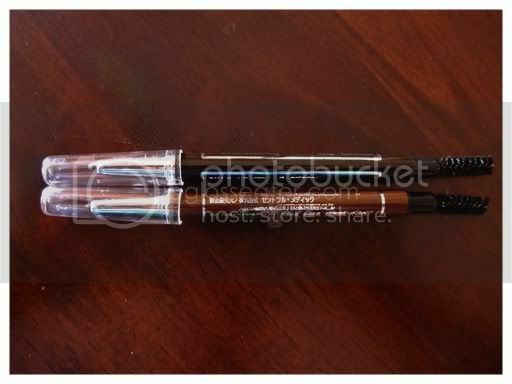 This eyebrow pencil goes on a little waxy, but thats the way with most auto brow pencils. It does applies smoothly though. There's a very faint plastic scent for this product, but i can hardly smell it once on! 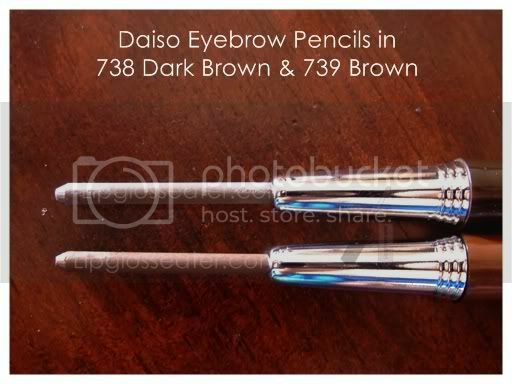 This eyebrow pencil is typical of your usual "auto" eyebrow pencils - it comes with a twist-up mechanism on one end, and a brow comb on the other end (which is really fantastic btw!). This one lasts more than 8 hours on my lids, but fades quickly in humid weather! 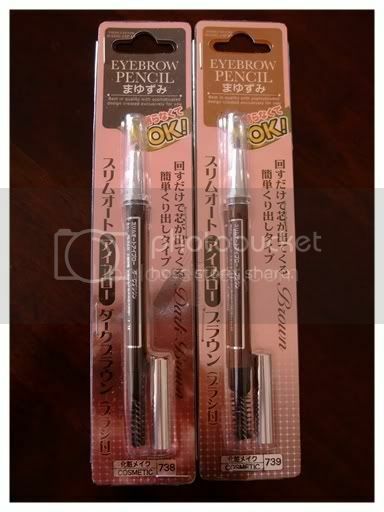 This liner is priced at RM5 and is available at most Daiso stores. 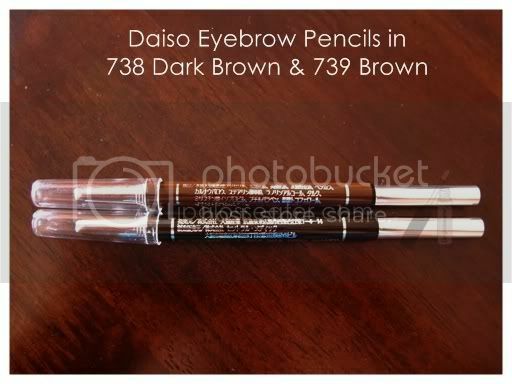 Alot of people love the old Daiso brow pencil, so when Daiso came to my island, i thought i'd pick one up and try! Unfortunately the old packaging is nowhere to be seen and is probably discontinued already, so i thought i'd just give these a try since they are so cheap! The only complaint i have is the lack of the ingredient list on the packaging. I would want to know what is the pencil made of. I have been using the Brown one and I adore it! I usually buy a few at one go to stock up at home! Diaso is selling refills too! Thanks for the review! You can certainly find some gems at Daiso if you look hard enough :-) I love that store. Must go check out this eyebrow pencil too! hi jenn,where is the chitchat box which stay on the right previously????? wanted to leave a message there but it was not there anymore??!?!?! want to chitchat with u via te box. hehe...sorry this comment is related to your review..
Hi Jenn! :-) Wow! what a great find! I'm gonna head for my Daiso. And I'm gonna buy grey color too! Wow I never knew Daiso sold makeup! I love this!! Am finishing my 1st one and thinking of getting more for stock up. It's user friendly esp it is so suitable to bring for travel. Hi dear! Congratulations for your blog, I am a new follower! How can I not notice your blog before!?!?! ?1 Followed you and totally loving the post! Especially the budget reviews! !